There’s an interesting discussion over at Mets Police about personalized jerseys. I find it interesting because I have not come across such a large group of people who are in the “Your Name Here” group. I have been drawn to sports uniforms since I was a kid, and I think the desire to own an authentic jersey for myself stems back to the sixth grade, when a classmate with generous parents would sport various jerseys, including an authentic Blue Jays shirt that still sticks in my memory all these years later. A couple years later, after saving up enough money, I had my dad take me to the mall, where I purchased a blank San Francisco Giants home jersey. I chose the Giants because, at the time, they sported the button-down design, while the Mets were still pulling theirs over their heads. My first had to be button-down. There was no name or number on that Giants jersey, and there still isn’t. It hangs in the back of my closet, too small at size 40 for me to wear anymore. Perhaps someday I’ll have it autographed and framed, but there’s no point now in getting Will Clark’s or Matt Williams’ name (the candidates at the time) sewn onto it. I own dozens of jerseys now, and while it may be a weird hobby to have, I’m lucky to work in an office where I can wear them during my shifts at night and on weekends. Truly, the dozens of ties I own, while not as costly to acquire as authentic baseball jerseys, are more of a waste of space and money, particularly now that I am at that age where most of my friends are already married. Personally, I’ve always considered putting my name on a jersey to be a weird choice, and I’ve never done it. I don’t have a common surname, so I’m pretty sure any jersey I put it on would be the first, unless there’s a second cousin out there who has already done so. I just don’t see the allure in taking the fantasy that far, though I do understand the awkwardness of wearing the shirt of a man 10 years younger and of far superior physical ability. As a teenager, my Nolan Ryan Rangers jersey was a sign of fandom; as an adult, my David Wright road jersey is slightly weirder, but still an indication of my admiration for his character and talent and the way he plays the game. Plus, I find the design of the Mets’ road jerseys to be as much a work of art as any jersey design is, even with the black dropshadow. I do suspect that many, if not a majority, of the unknown names on jerseys I see at Mets games are worn by former fantasy camp participants. (That’s my theory on the above photo.) I tend to see a lot of men in their late 30s and older who sport the blue and orange with what appears to be their own names and some unique numbers on the back. Some years ago, I came to this conclusion, but I have yet to do any research. Perhaps, if I get to enough games this year and see enough examples, I’ll start asking questions. Along the same lines is the obscure player on a jersey. Straight Cash Homey chronicles this phenomenon, and I suspect the proliferation of these “in the wild,” as Shannon likes to say, stems from the market available on eBay, at club fanfests in the offseason and in team clubhouse stores at the ballpark. Some people may get a kick out of sporting a game-worn jersey by a player, no matter how obscure he is or how small his role may have been. There’s only one authentic jersey I’ve ever bought and later sold. In 2006, fresh off the Mets’ dethroning of the Braves, which was the only competitive rivalry in the NL East at that time, I purchased a Ryan Howard Phillies jersey with the All-Star Game patch from Pittsburgh. I loved the design of that patch (my wife is from there, so I have an affinity for the Steel City now) and the idea of commemorating Howard’s first All-Star nod. I covered Howard when he played for the Lakewood BlueClaws in 2002 and enjoyed his rise to stardom — before 2007, when his rise contributed to the Mets’ demise. After that season, knowing I couldn’t comfortably wear that shirt again, I sold it on eBay to someone in Atlanta who said he’d get it signed when the Phillies came to town the next season. I’ll probably become a fan of Howard’s again should he ever leave the Phillies, except if it’s to bring Albert Pujols to Broad Street (but it won’t be). I now have nearly 50 Major League, minor league and college jerseys. Most are authentic, several are true-to-life remakes (mostly Mitchell & Ness) and a few are game-worn. For no particular reason other than I tend to be a completist — I’ve started discussing my baseball jersey collection, so now I want to give the whole story — here are the jerseys I own, in no particular order, grouped by various themes. 2008 Jeff Samardzija Chicago Cubs home pinstripe. I obtained all three without names about two years ago through various means (a friend bought the Cardinals at the team fanfest one winter; I got the Nationals at a sample sale and the Cubs on eBay) and the friend who procured the Cardinals jersey also got me in touch with a guy he knows who does professional stitching at a reasonable price. A few weeks ago, these three came back with the names. Ankiel is with No. 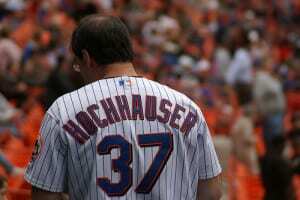 66, his pitching number, because a) the jersey is from the 2000 set (it’s on the tag on the inside) and b) I was at Game 5 of the 2000 NLCS at Shea Stadium. 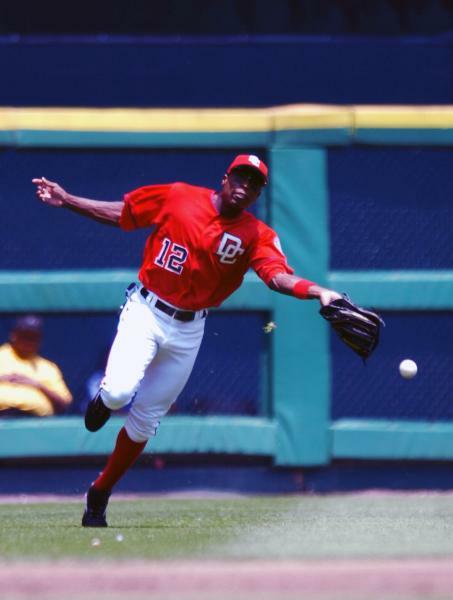 I purchased the Nationals jersey because it sports my initials, DC, and decided to go with Soriano because 12 was one of the numbers I wore in high school and his one season in D.C. was historic — 40 homers, 40 steals, 40 doubles. Samardzija is a Domer, simple as that. 2001-04 Pittsburgh Pirates home sleeveless. The Giants one has been discussed. I stumbled upon the Mets jersey in a fan shop near Tiger Stadium in Detroit in 1999, when they’d gone to the black, and jumped on it because it has no dropshadow. I’m still debating what name and number to adorn it with. I bought the Indians, Marlins, D-backs and Pirates jerseys for cheap on eBay and will one day choose names and numbers to go with them. I’m leaning toward Grady Sizemore for the Indians and perhaps former Met and original Marlin Dave Magadan for the Florida shirt (Mike Piazza didn’t wear this style during his one week in South Florida). I had long considered former Trenton Thunder prospect Freddy Sanchez for the Pirates jersey, but now that he’s in San Francisco, I may go with Andrew McCutchen if he blossoms this year. I am still unsure about the Arizona choice. All were purchased at steep discounts, either at sample sales, with online discounts or at this year’s Super Bowl week sale at the Mitchell & Ness flagship in Philadelphia. In addition to being a fan of the 1969 Mets road jersey style, I’m clearly a big Nolan Ryan fan. The ’93 Rangers jersey was a sample-sale find and augments the original authentic I received for my birthday in 1993. Like the Giants jersey, it’s now a too-small size 40 for me. The last time I wore it was the day he was inducted into the Hall of Fame in July 1999. I didn’t go to the ceremony, but I was at the ballpark in Detroit, visiting Tiger Stadium before the club moved to Comerica the next season. The Musial is a zip-up; the Paige is a mostly plain jersey save for the classic Brownie logo on the sleeve; the Fox sports No. 2 (another number I wore throughout my youth, because of my Sept. 2 birthday); the McClain is the classic Tigers “D” I’ve always loved; the Fingers is both from my birth year and he went into the Hall with Tom Seaver (an induction my family did attend); the Stargell is that garish-yet-beautiful gold; and the Ripken is the modern Orioles design that has always stood out to me. The ’66 Seaver and ’08 Curve are reproductions/replicas obtained for their uniqueness (Seaver) and style (Curve). All the others are game-worn. The Wranglers were bought on eBay with letters of authenticity; the pinstriped one sports No. 15 and was worn by Carlos Beltran. Likewise for the Swing and Mustangs jerseys, bought because I love their quirky (Swing) and classic (Mustangs) lettering and colors — the Swing is a rust orange with sky-blue lettering; the Mustangs features black lettering with red outlines in a old-West font, with a pair of horseshoes forming the “M.” The Crosscutters features a cool lumberjack logo on the sleeve (and was worn by one-time Mets farmhand Henry Owens) and the Thunder is a simple, classic look I liked that season and features No. 12. It was bought from the team, as was the BlueClaws jersey from their inaugural season. Both were bought to fit me more than for the players who wore them (Vince Faison in Trenton and Anthony Kennedy, No. 33, in Lakewood). I bought the N.J. Cards jersey after the team’s final season in 2005 because it was the one that had “New Jersey” written across the front. The Crocs were the franchise that was bought and “moved” to Lakewood; the jersey is in rough shape, not surprising for a team that played at an American Legion field and had its offices in mobile trailers. Yeah, the Counsell is definitely a weird choice, but it was a relatively cheap game-worn jersey of a Domer found on eBay. My initial bid won out, so I can’t complain. The Alou and Putz jerseys were clearance items at MLB.com, both bought after they’d become Mets. The Wright has been explained and the Santana features the Shea Stadium patch. The Pirates is the garish and not-so-great and now-ditched alternate. I bought it to actually play in (when it’s not too hot) because no one would really wear that design as a sports fashion statement. I bought the Big Unit on eBay because I liked the new design of Arizona’s uniforms. The Martinez Red Sox jersey, with no name on the back, can double as a rare Seaver as well, if you ignore the MLB logo on the back by the neck or the Majestic logo on the sleeve. The Mauer is a great classic design that now has more staying power, even though that version was nameless on the back as well. I bought these because I like the designs, the incorporation of the Golden Gate Bridge and Gateway Arch into the lettering in the ’07 and ’09 versions and the Yankee Stadium facade in ’08. Though I understand they’re mostly for marketing purposes and I hope MLB never goes the way of the NBA and has the teams wear uniform uniforms in the actual exhibition game, they are cool and comfortable on hot summer nights. The three Mets choices are obvious, and I bought the Crawford because I had him in the MVP pool at work last year. I used the modest winnings to buy the jersey. I’m still trying to obtain a yellow National League jersey from 2006, preferably Wright or Reyes, but I’m no longer being picky. I missed out on a Reyes jersey in my size that went for cheap on eBay several months ago. I opened the daily e-mail alert for 2006 MLB All-Star jerseys too late and the auction had ended. I believe the winning bid was under $15. Alas. Thanks for the link. I have been surprised how many people are anti-personalization. I just want to be the Mets fifth starter. I have 4 authentic jereseys, all diamondbacks, the new black, red, and grey jerseys. all three of those are personalized. And the fourth is a blank home vest from 1999. Personally I feel like a jersey is empty if there is no name or number, and honestly I didnt think there was anyone on the Diamondbacks currently that was a star worthy enough of being on the jersey plus anyone that possibly could be off the team in the next couple of years i wouldnt want them on there either (That could be everyone).So I thought why not get my own name and number on the back so it adds a personally touch to these valued items. Thats just my two cents. Was wondering if the Rick Ankiel could be purchased? I’m sorry, I no longer have it.